Flygo Clear Anti-Fly poster Paint prevents adhesives such as glue, wallpaper paste, and even Superglue from adhering to walls protected by its non-stick finish. Unsolicited advertising posters will not adhere and the increasingly common “Sticker-Bomb” Graffiti attack is rendered ineffective as Sticker Based Graffiti Tags blow away. Flygo Anti-Fly poster Paint protects Street Furniture, Roller Shutters, Lampposts and any other external surface that may be attacked and is a “True Permanent” solution to the Fly poster problem with a single application of this Adhesive Resistant Coating lasting more than 20 years without the need for reapplication. Our High Streets and Town Centres are crowded with cabinets and street furniture which are a magnet for Fly posters and unsolicited advertising fliers. Protecting surfaces such as these with Flygo Poster Clear Anti-Fly poster Paint ensures those wishing to illegally advertise their events or wares are unable to do so. One coat of Flygo lasts for 20 years and withstands 1000’s of poster and sticker application attempts. Flygo’s non-stick nature also lends itself nicely to graffiti prevention. 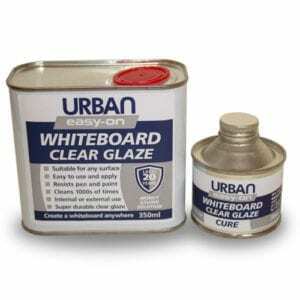 Surfaces protected by this adhesive resistant finish also repel graffiti including permanent marker pen, graffiti spray paint and ink, and dye-based graffiti media. Water washable Flygo requires no specialist Graffiti Removal Products to clean graffiti from its surface which will withstand 100’s of graffiti removal operations. Bird Foul is effectively cleaned from the Flygo surface by the passing of rain. The ultra non-stick, low surface energy finish of Flygo means droppings or Guano cannot adhere and are washed away easily. This greatly improves appearances and reduces health hazards associated with bird foul contaminated windowsills and building facades.